This versatile, multiple-use harness for fire rescue features our JackBack� removable padding with breathable D3 cloth, which keeps shoulder straps separated, making donning and doffing faster. 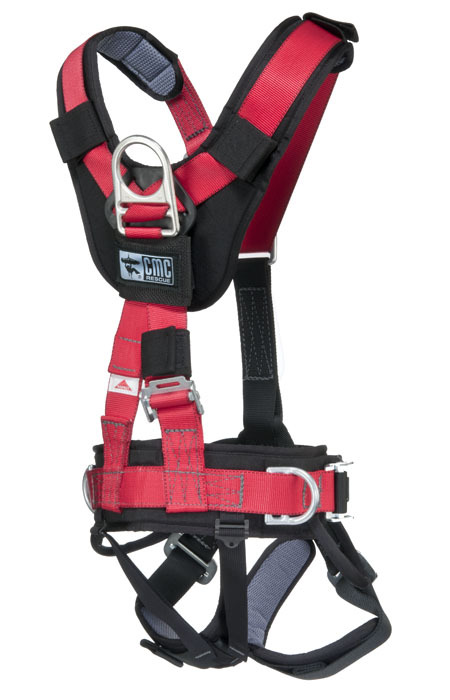 Used by fire department rescue teams, USAR teams, helicopter crews, and wilderness SAR teams, this extremely popular harness also features a dorsal D-ring that allows adjustment for different size rescuers, but stays in place when loaded, greatly increasing comfort. Gear loops have been improved for easier access. The front waist D-ring allows a comfortable, stable sitting position for rappels and the sternum D-ring works well for helicopter hoists. Quick-connect shoulder straps and leg loops make donning the harness simple and fast. Pads on the leg loops can be adjusted to the most comfortable position. The front lift assembly accepts screw links for adding a chest ascender or safety lanyards. Attachment points: front waist, sternal, dorsal, and sides. While the dorsal D-ring on our Fire-Rescue Harness adjusts so it can be properly positioned, it is designed not to slide up when the D-ring is loaded. If the force of loading the harness, either under normal use or during a fall, slides a dorsal D-ring up toward the back of the user�s head, the web going over the shoulders could pinch in toward the user�s neck. Not only is this uncomfortable, it could even compromise the carotid arteries with severe results. Fixing the dorsal D-ring to the rear waist portion of the harness prevents this from occurring and allows the peak impact force to be absorbed by the pelvis and the thighs�as opposed to the back�increasing rescuer comfort and safety. New Fall Arrest Indicator displays a warning if the dorsal-D ring has been subjected to a force that could compromise the integrity of the harness. Size: Large / X- Large - Waist size 34 - 46 in.